Hiring an employee, be it an independent freelancer or a virtual assistant can sometimes prove to be a herculean task. This is a derivative of the overwhelming options available to us today which makes it hard to filter and choose the right candidate. Hence, to reduce your hiring woes, below is a list of pros, cons, and differences between the two, to give you a better idea. In a typical corporate or office set up, employees are usually made to sign Non-Disclosure Agreements or most commonly known as NDA’s, since it is important to keep any of your personal information away from prying eyes. Certain, virtual assistance companies in this case, offer secure sharing services that help keep your credentials and information secure. With independent freelancers however, no such services or agreements aren’t guaranteed. 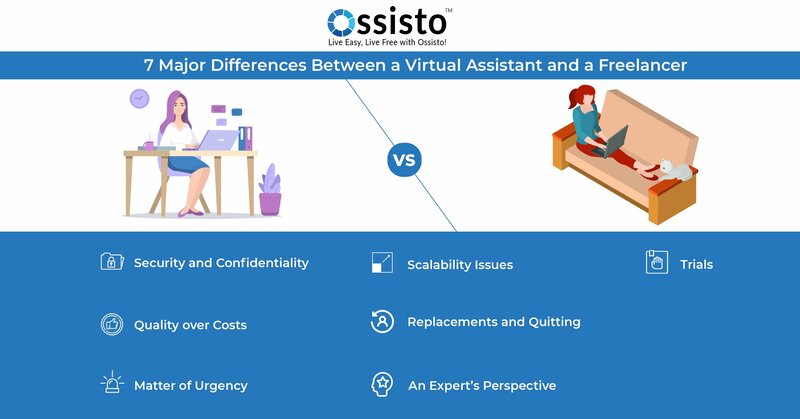 Compared to a virtual assistant a freelancer might be a good alternative for those who are eager to save some money. But, with respect to quality, then, hiring the former is undoubtedly a better option. The experience and expertise that the virtual assistants process is considered to be far greater than that of an independent freelancer. Let’s suppose that you’ve got a high priority task that needs to go out immediately. In this case, a virtual assistant would tend to it quicker than a freelancer. Since a freelancer would be mired with the work of other clients on their schedule, one would have to wait until they have time for them, which would result in the loss of precious time. Virtual assistant companies have the capacity to adapt to the size of an enterprise’s growth and cater to it accordingly. For instance, if a firm starts to expand faster than usual, then, the company will be able to procure the necessary assistants to compensate for its ever-growing need for the human resource. A freelancer would instead, be limited by the nature of his working mechanism and hence would not be able to do this. There are two different ways in which a virtual assistant or a freelancer would function here. While a freelancer would have to work harder to make up for the replaced employee, he/she will still have certain shortcomings as well. During times of need such as this, virtual assistant companies will immediately replace the assistant who has quit on you. Though freelancers and virtual assistants are both experts in their relative field, a virtual assistant company would give access to a team of experts in various fields whereas, a freelancer would be an expert in a single subject matter. With freelancing service being affordable, many people tend to choose them but have often found themselves to be dissatisfied. Hence, individuals are slowly moving towards hiring a virtual assistant to get better and optimal results instead.